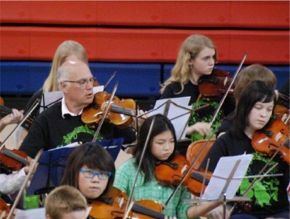 Henry joined nearly 400 string players setting a World Record at String Jam 2010! Henry Bischofberger, third generation violin maker, learned his craft at the Swiss School of Violin Making in Brienz, Switzerland. He continued his studies in San Francisco before returning to Seattle where he ran the family violin business on Capitol Hill for 12 years. He brings over 35 years of experience to his new shop on the Eastside of Lake Washington. With this location in Kirkland, Washington, Henry Bischofberger Violins is uniquely positioned to serve the Eastside communities of Kirkland, Bellevue, Issaquah, North Bend, Bothell, Redmond, Woodinville, Sammamish, the Plateau and surrounding areas while still providing impeccable service and workmanship to clients in Seattle, all over the Northwest and around the world. Henry Bischofberger Violins specializes in violin, viola, cello and bow sales and purchases in all price ranges, expert instrument restoration, appraisal, setup and repair, bow rehairs, and well crafted, high quality rental instruments. Promoting the music community as an integral part of his business philosophy, Henry Bischofberger serves musicians of all ages, from beginning students to professionals, teachers, local orchestras and schools. String instrument players want their instruments looking and sounding their best. Visit us at Henry Bischofberger Violins, where we have what you need to achieve the level you desire. Voted Best Musical Instrument Store, 3 years in a row!